Hey there! It feels like forever since I've created/posted! My family and I enjoyed a wonderful vacation in Alaska the first half of this month, and it's been an adjustment trying to get back into the crafty headspace (as opposed to the outdoors/recreation/nature/scenery/it's-still-light-at-midnight headspace!). Today's card is the first I've managed to finish since we got back, and I have to say, it felt great crafting again! I even filmed a little video, so I'll have a tutorial tomorrow for that farmhouse-inspired gate in the background! 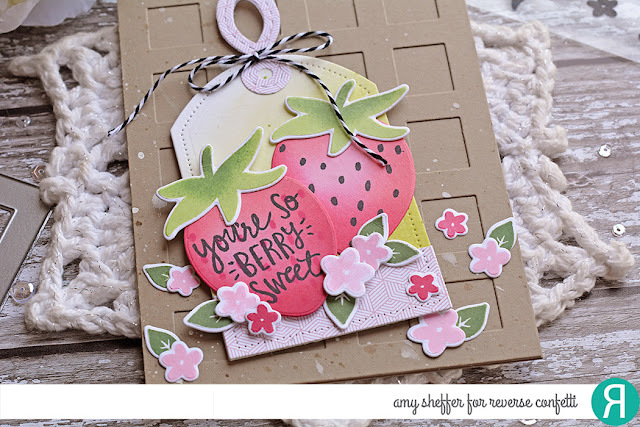 I've used Reverse Confetti's July Sketch For You To Try for my layout. The challenge is open until noon on the 29th -- plenty of time left to join us! You'll find all the details and link-up HERE. 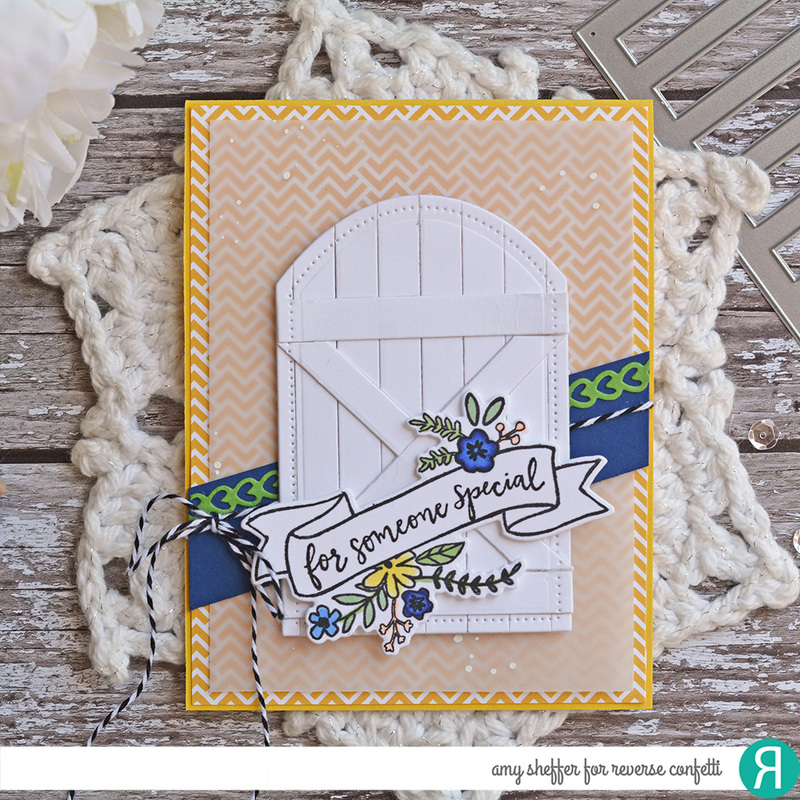 I've used the Pierced Round Top Layers die set and the Vertical Stripes Cover Panel die for the farmhouse gate. 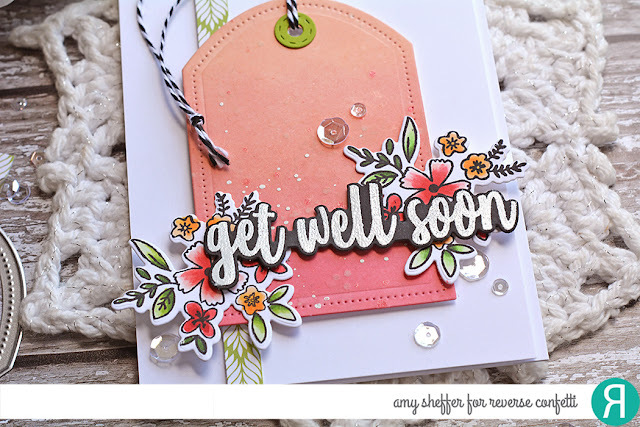 The floral banner is from the new Banner in Bloom set, and the yellow pattern in the background is from the new Under the Umbrella 6x6 paper pad. 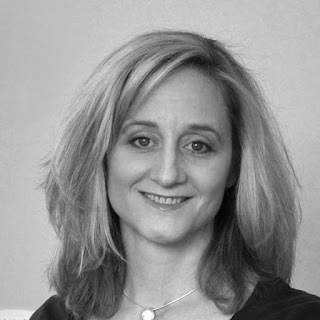 Hey there, today is my turn on the Queen & Co blog. Hope you'll visit me over there! I'm sharing two encouragement cards today. 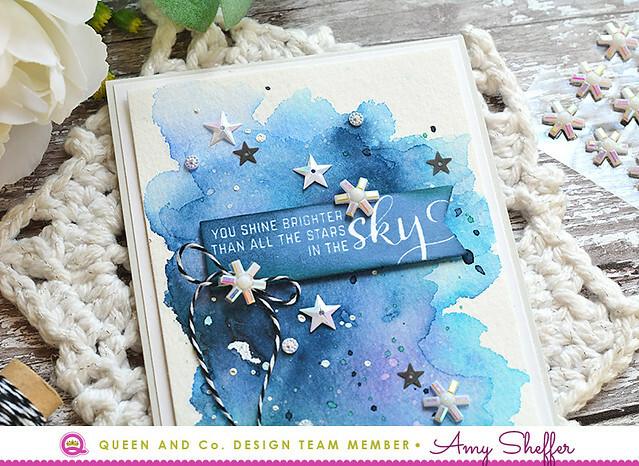 This first one features an intense watercolored night sky along with various Queen & Co. bling for the stars. And then this next one features a clean white background with a rainbow of Twinkle Drops and a stitched cloud. 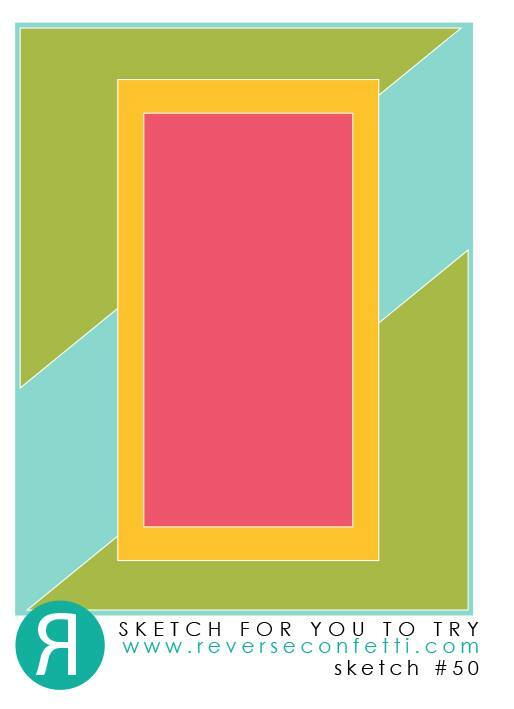 For more info on these two cards, visit me at the Queen & Co. blog! It's time for a new Wednesday in the Works project and video over on the Reverse Confetti blog. 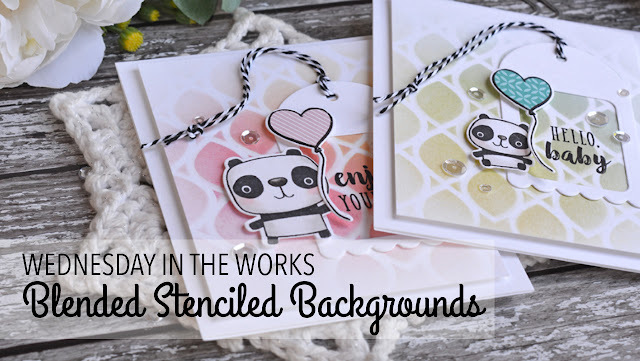 This week, I'm using the new Leaf Lattice Stencil to create some beautiful ink-blended backgrounds. 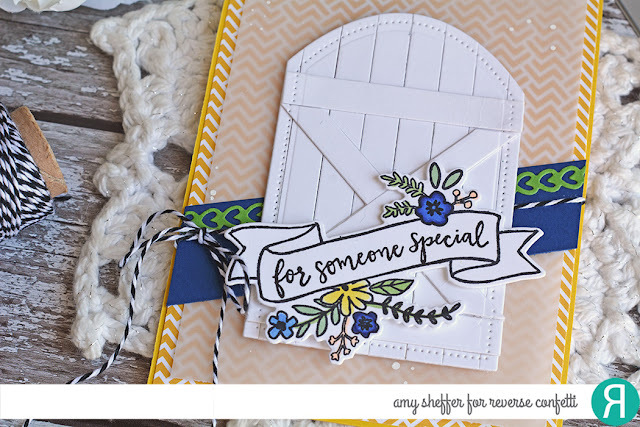 Check it out HERE on the Reverse Confetti blog or HERE on the Reverse Confetti YouTube channel! 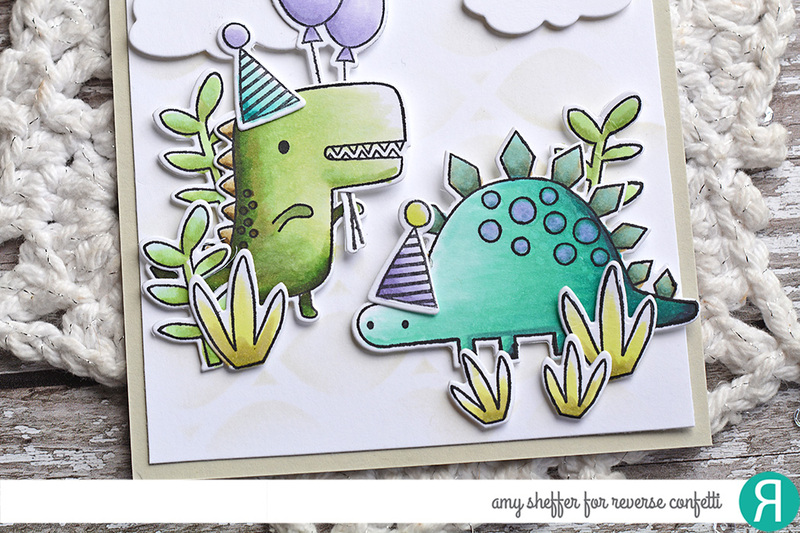 Welcome to Day Three of Reverse Confetti's July release countdown. Today's previews are Berry Sweet and Mahalo. 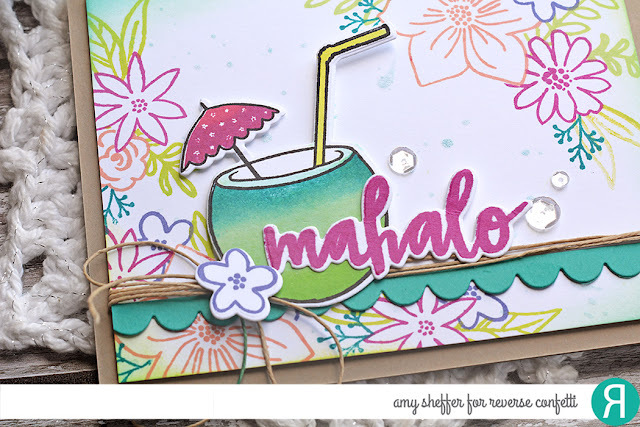 Mahalo stamps and dies + lots of new ink colors! 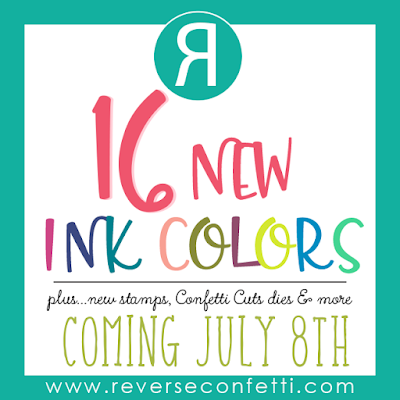 For links to all of today's countdown peeks, visit the Reverse Confetti blog. Hello and welcome to Day Two of Reverse Confetti's July release countdown. Today we are sharing new adorable new sets by illustrator Dawn Machel: No Tomorrow and Magical Day. And here's a look at two new dies: the Hello Square and the Thanks Square -- perfect for quick and simple cards and perfect over interesting background papers. I layered the die-cuts over some nail polish marbled backgrounds. Thanks for visiting! 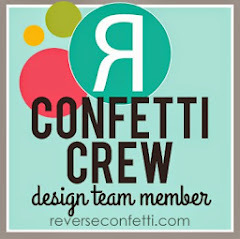 You'll find links to all the design team countdown projects on the Reverse Confetti blog. 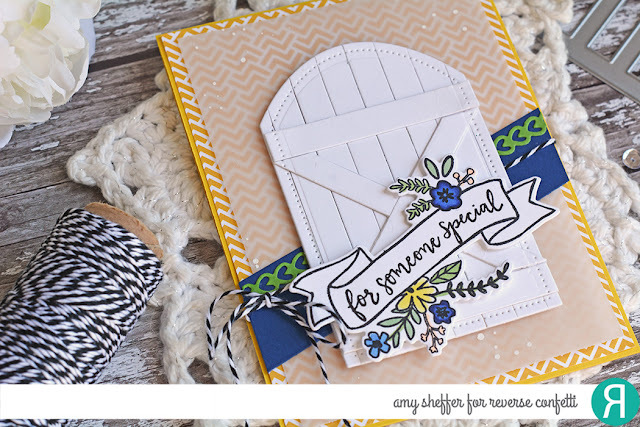 Welcome to Day One of Reverse Confetti's July release countdown! The July release includes 7 new stamp sets, 11 new die sets, 1 new paper pad, AND ..... sixteen new ink colors. That's right! Sixteen! Wait 'til you see them all! 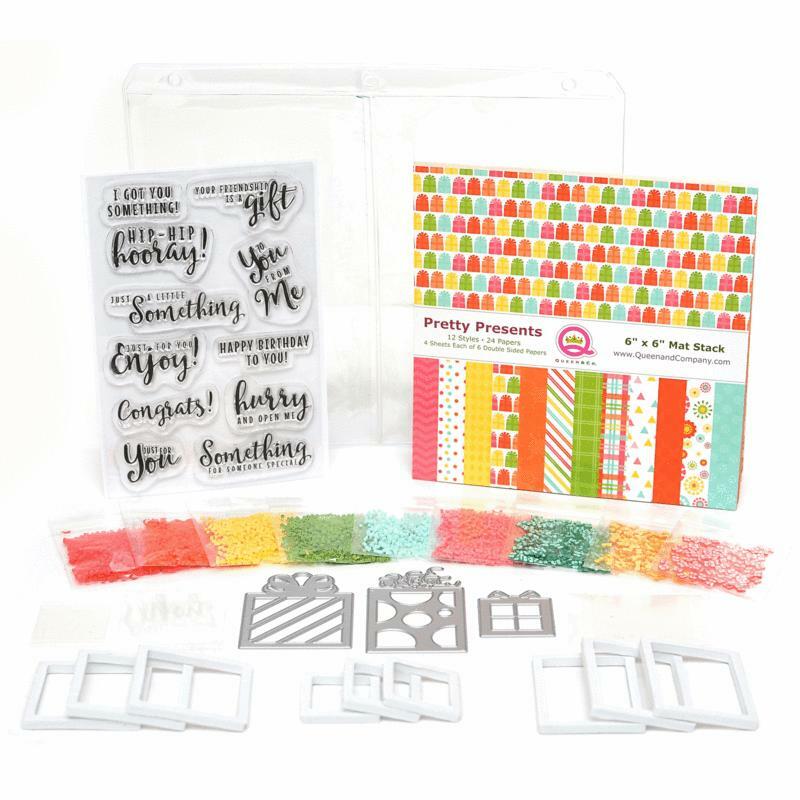 Today we are previewing three of those stamp sets, each with coordinating Confetti Cuts dies: Build A Bunch, Sentiment Essentials, and Banners In Bloom. Check out all the new release info on the Reverse Confetti blog. For this first one, I took a cake foam shaker from the Birthday Shaped Shaker set and made it into an American flag. 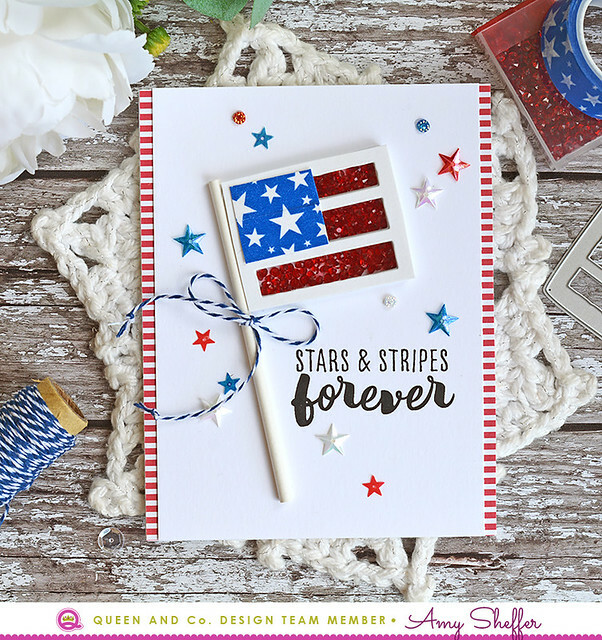 For my next card, I created a fireworks display using a combination of stamped starburst images and red, white, and blue Pinwheels and Petite Posies. Along the bottom I added two different washi tapes, baker's twine, and a festive White Pom Flower. 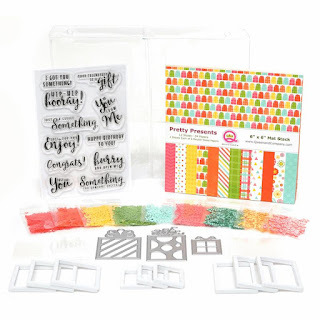 Queen & Co. Supplies: Blue Pinwheels, Red Pinwheels, White Pinwheels, Blue Petite Posies, Red Petite Posies, White Petite Posies, Twine Assortment, Blue Skinny Glitter Tape, Red Star Washi Tape, White Pom Flower. Wishing my USA readers a safe and happy holiday tomorrow! 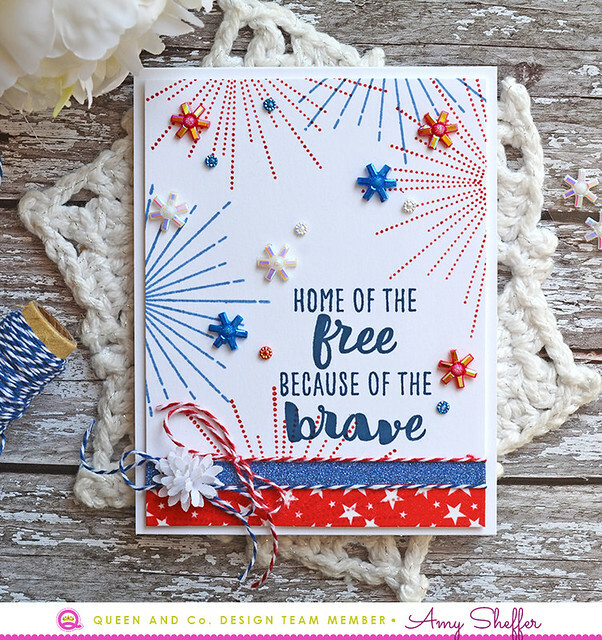 I love this sentiment from Queen & Co.'s Pretty Presents Kit. It makes me think of the frenzy of a kids' birthday party, with tissue paper, gift bags, and cards flying every which way. To translate that idea to a card, I arranged the different packages randomly to cover the card front, almost as if the packages themselves are flying through the air. 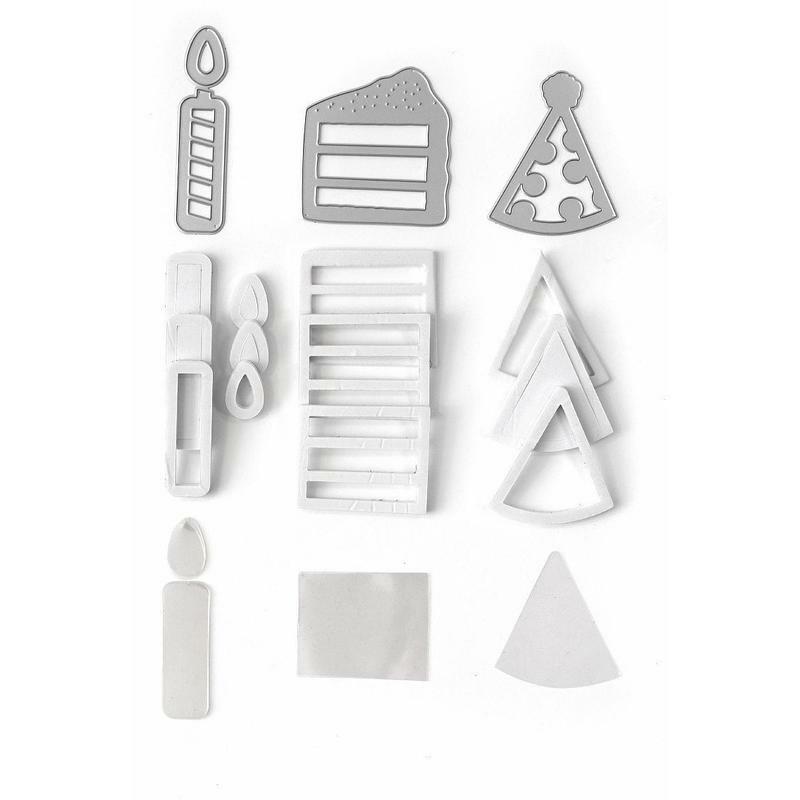 The gifts are all die-cut with the present dies in the kit, then backed with a contrasting pattern from the Pretty Presents paper pad. Before adhering to a white card stock background, I splattered the background with yellow, aqua, and pink inks -- a confetti of sorts. For more of my creations with the Pretty Presents kit, click HERE or HERE.